Length: 459mm. Image shows painted and assembled kit. 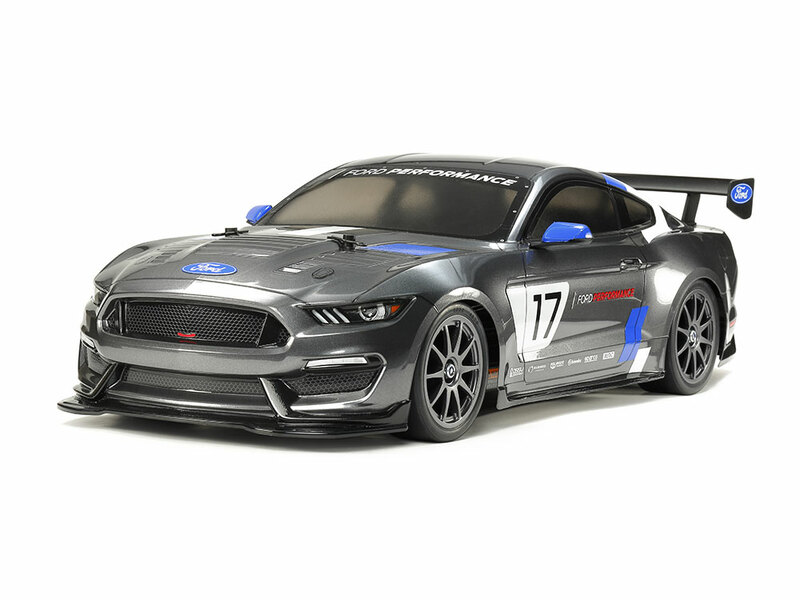 This R/C model assembly kit recreates the Ford Mustang GT4, a race-ready powerhouse race-ready powerhouse featuring honed aerodynamic form with front spoiler, rear wing and diffuser, improved brakes, plus lightweight carbon fiber vented engine hood, roof, door panels and more. Its high-performance 5.2-liter V8 engine is housed in the front. 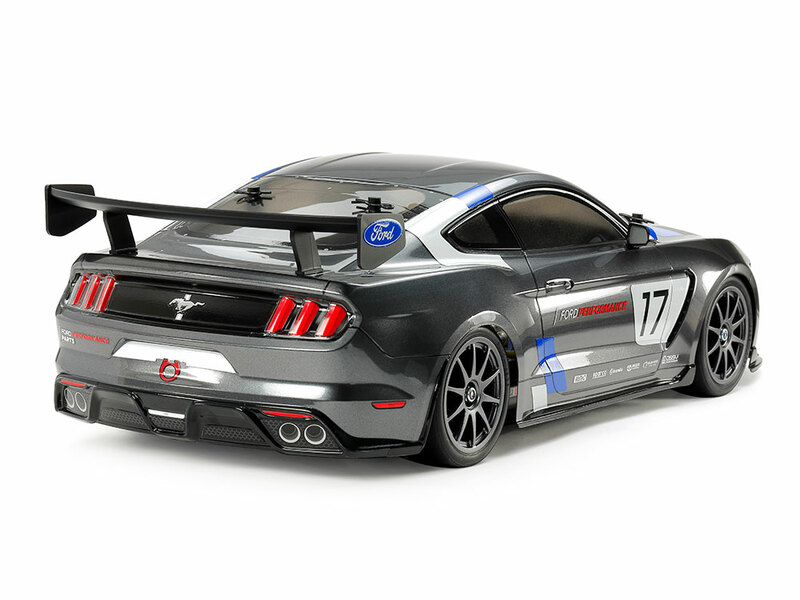 The model captures the car's muscular form with a polycarbonate body, plus separate parts depicting rear wing, side mirrors and more. Stickers are included to recreate the markings seen when the car was exhibited at the November 2016 SEMA show. ★Left: The rear of the model oozes power, with representations of the quad exhausts, diffuser shape, and rear wing. 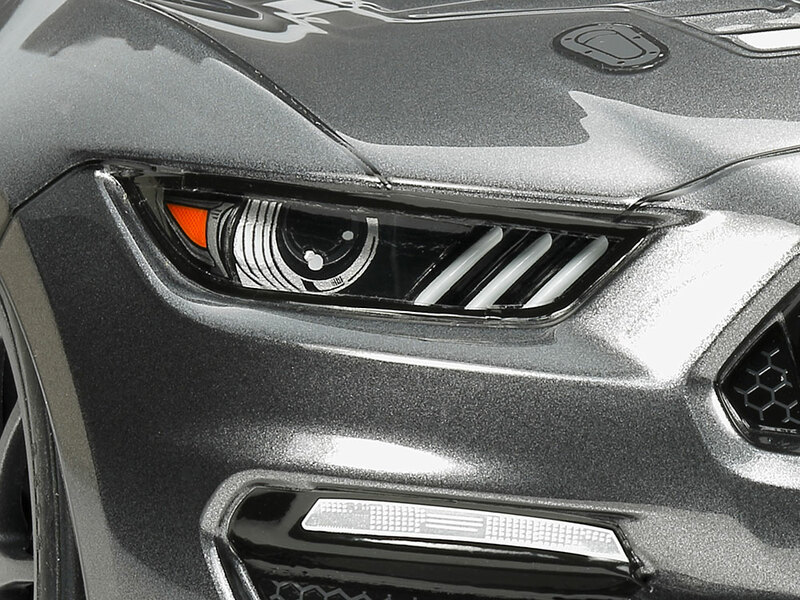 ★Right: Looked at from the side, the model shows off the car's muscular, powerful form in real style. ★Left: Light cases are separate polycarbonate parts, with stickers included to finish off the realistic look. 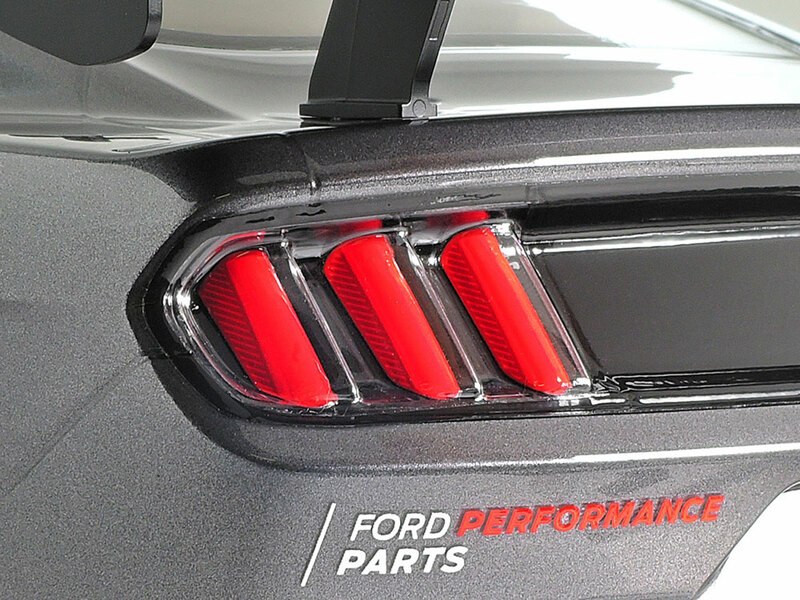 ★Right: At the rear, too, separate polycarbonate light cases and stickers are employed to capture taillights. The shaft-driven 4WD TT-02 chassis employs a longitudinal layout with the battery on the left and the motor on the right, to give excellent stability. In addition, it features identical left and right suspension arms and uprights for ease of assembly, plus easy-to-maintain gearboxes. It is a highly adaptable chassis, as it offers 2 different wheelbases, 2 ground clearance settings and 2 tread set-ups in addition to a range of 10 possible gear ratios. It is not short on looks either, with brake disc-shaped wheel hubs and stylish front bumper supports. 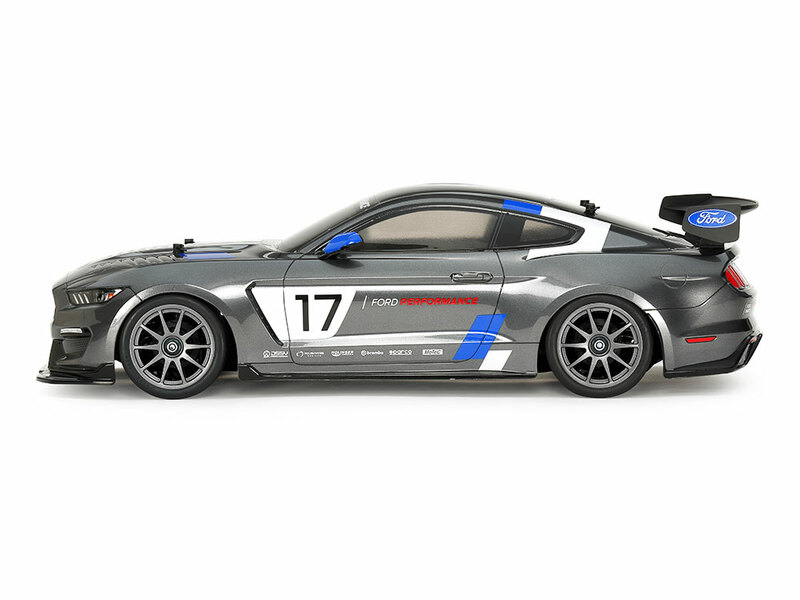 Gun metal color 10-spoke wheels and slick tires make for a racy finish. ★Length: 459mm, Width: 188mm, Height: 130mm ★Wheelbase: 257mm　★Tire Width/Diameter: 27/67mm (Front & Rear) ★Bathtub-type Frame ★Shaft-Driven 4WD ★Front/Rear 4-Bevel Resin Differentials ★3-Piece Steering Tie-Rod ★4-Wheel Double Wishbone Suspension ★Front/Rear Friction Dampers ★Gear Ratio = 8.27:1 (9 further ratios from 11.38:1 to 7.28:1 possible with use of separately-sold pinions) ★Type 540 Motor ★Electronic Speed Controller (ESC) is sold separately.